We have modified our weekly schedule for this year. One of the reasons we are doing this is to try to encourage our friends who visit us to consider volunteering on Saturday morning here at the retreat. We will work as a team, usually on one of 2 never-ending projects: prepping and painting sections of the outside of our 3 houses, and working in the various gardens. These are actually simple jobs that anyone can do. Please consider joining us. We are giving so many tours that we are not always able to get to our work here. If you do intend to help, PLEASE come dressed appropriately. That means long pants socks and good shoes, not sandals.If you have helped us that morning then please join us for lunch! This will be an intensive, verse by verse study of the Svetashvatara Upanishad with Gitaprana, including group discussion and other activities. We may be podcasting this class. We will resume our Sunday activity of chanting/reading the Devi Mahatmyam and commentary. Our ongoing Bhagavad Gita class is led by Gitaprana. It is a group-oriented study rather than a lecture series that moves verse by verse in an in-depth manner, focusing on what each verse has to say for people living today. NOTE: We have changed the date from Oct. 9 to the 8th in case you noted it from our earlier emails. We will worship the Divine Mother in Her form as Durga Devi with a simple puja/ritual worship, followed by a homa fire and then prasad. As always, music/bhajans/kirtan is provided by you, the attendees! Inviting all singers to make music offerings. You can also bring offerings of food or flowers provided that they are new. The idea here is that the goddess should be the first enjoyer of the taste, fragrance, form etc. If you are going to bring offerings please bring them at the beginning of the puja. All are welcome. Swami Atmavidyananda is a monk of the Ramakrishna Order who lives, works and teaches at the Vedanta Society of So. Calif. and in the Los Angeles area. He is a multi-talented individual who combines Vedanta, science and music into his spiritual path. The retreats and talks that he gives incorporate this lifetime of study in wonderfully unique and interesting ways. We hope you will be able to attend all or part of this retreat and hear for yourself! 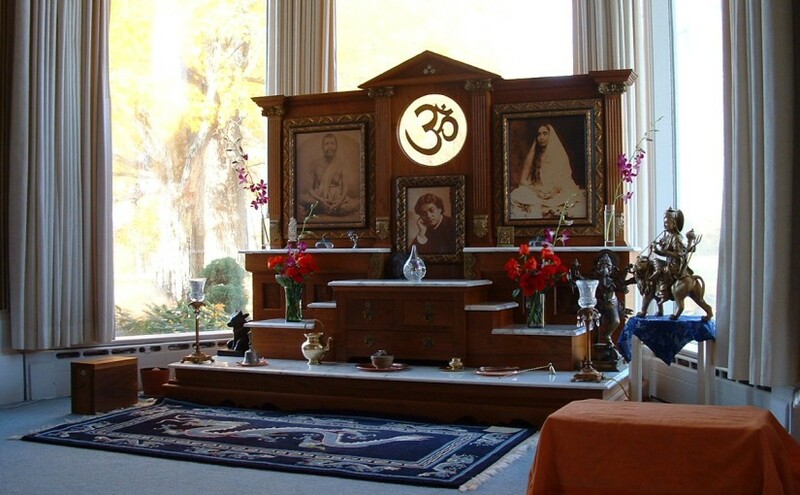 Please note: to accommodate Swami Atmavidyananda’s schedule the retreat will start Saturday afternoon instead of our usual morning start time. Part 1 Comparing world mythologies on creation. Part 2 Seeing how sound, music, and vibration in general can be useful as a model of the universe and how this model influences spiritual practice. Part 1 Starting with the idea that we have mistaken the infinite, undivided unchanging Brahman for something else, what kind of a universe would we expect? Part 2 What kind of spiritual practices fit with an apparitional universe model? ” prajñānam brahma” Consciousness is Brahman. Part 2 The Hindu view of consciousness and seeing consciousness everywhere. We are happy to announce that Swami Sarvadevananda, Head Minister of the Vedanta Society of So. California (and also Ridgely), will be visiting us in April. He will be givinga retreat on the Katha Upanishad. This upanishad is unique, consisting of a single storyline: the young boy Nachiketa taught about the Self by Yama, King of Death. Many of you know and loveSwami Sarvadevananda ; we hope you will be able to attend all or part of this retreat. Here is a schedule for the retreat. Swami Yogatmananda will join Vivekaprana and other speakers to discuss the role Western women played and continue to play) in the work of Swami Vivekananda. Swami Yogatmananda is the Head Minister of the ramakrishna Vedanta Society of Providence. He visits us every year during the Labor Day weekend. We are very happy that he has agreed to be part of this symposium. If you wish to attend any of these retreats as an overnight guest YOU MUST REGISTER BY MARCH 15. Why? Because we already know that there will not be room at Ridgely to accommodate everyone who wishes to attend. We are considering renting additional space close by if needed. To do that we need to know how many people are on the overflow list. Please be aware that we will most likely give preference to those people coming from a long distance. As of today, THERE ARE ONLY SHARED ROOMS AVAILABLE, NO SINGLES. All are welcome to attend these retreats as day visitors. We will be announcing the details again as the year progresses. The other sanyasin comes today no doubt as Joe went to fetch her Sunday evening. We are all in waiting–and the week promises a look at you all–including Dr Helmer. Let naught prevent an early arrival. I hope 01ea is mending rapidly & when she can hold together let her come and be upon the couch in the great hall–or the loggia & listen! How I regret it all–and wish we had sent for her to come when we learned of Swami’s departure from England as we were sorely tempted to do…. We expect Mrs [Florence] Adams the 22nd. Swami needs Dr Helmer badly–he needs to be told the end is not yet. There are many hours when he thinks It is near, as symptoms are graver, in his mind, by heredity. Joe arrives today. The big cottage awaits you–and is ready. Swami & Turiananda are in yours–to be more cozy. Swamiji is writing a book on Modern Hindoos–to make some independent means–and to keep busy. He is grand in type as ever. Margo & I arrived at 3 P.M. yesterday after a joyous 24hours together.–I am beginning to feel that I am almost as glad to know her as Swamiji. Today we decked her in our finery–then came down to Swamiji for criticism–which never came. He put the decision entirely into Margot’s care and she said “If I may do as I choose, I shall wear my brahmacharini gerrua always–while on the platform–black otherwise,” & so it is decided–and tomorrow we will go to Kingston to see what can be bought in the way of tough material. She never was greater, & Betty approves in each detail of her attitude to Swami. Not one thing wld she have Margot change–& her verdict is final in social matters as Margot’s is in spiritual. Your telegram was a blow–last night–10 days longer away-but “Mother knows best” I have no servants for you yet. Dr. Helmer will decide what Swamiji is to do and in this his verdict will be final. [Nivedita added a line:] My sweet Grannie–no idea had I that post time had come. It was the desire of my heart to write to you this morning. Here I am–Plans are growing like flowers. I long to see you & begged Y.Y. to let me come & try to carry off Mrs Vaughan & you! But of course I saw that that was a wrong suggestion–anyway, you will be here directly. Lovingly your Child, Margot. 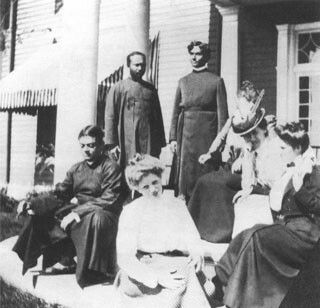 The three Swamis lived, of course, in “Swamiji’s Cottage.” In Vivekananda, a Biography in Pictures, one finds a photograph of the Swamis, together with Mrs. Leggett, Miss MacLeod, Alberta, and a friend of Alberta’s, whose name is not known. In another photograph of the same people, taken on the same day, at the same place (the circular portico at the back of the main house) one sees Swamiji standing and looking unwell and Alberta with her face in her hands, shielding her eyes from the afternoon sun. Swami Abhedananda stayed at Ridgely for about ten days, leaving on September 17 or 18 for New York, where (before going on to Massachusetts) he met Sister Nivedita, who arrived from England on September 19, her voyage paid for with money from Joe. As Mrs. Ashton Jonson had predicted, Nivedita had not fared well in England as far as raising support for or interest in her girls’ school was concerned. Nor, it would seem, had she been able to reawaken enthusiasm for Swamiji’s work. “One thing I am sure of,” she had written to Miss MacLeod on September 1, “however little the drones think they worship success, they soon drop off from a cause that fails. One must show life and growth, if one is to keep even the hearts that are won.” In her small 1899 diary (the first 253 days of which are missing) the sole entry (September 10) for this brief English interlude reads, “No use,” from which one might gather a certain despond. Many thanks for your kind note I will be so so glad to see you. Miss Macleod is going to write you to stop a day and night here on your way to the west. My love to the holy family in Chicago and hope soon to be able to come west and have great fun. So you are in Greenacre at last. Is this the first year you have been in? How do you like the place? If you see Miss Farmer [Miss Sarah Farmer, the founder of Greenacre] of course kindly convey her my kindest regards and to all the rest of my friends there. Your letter this morning was a great pleasure to our household. We should be so pleased if you and your sister will stop over with us a day and night on your way home–If you will let me know the date, I will arrange to have a free place for you and to meet you at the Station Binnewater: four miles off. 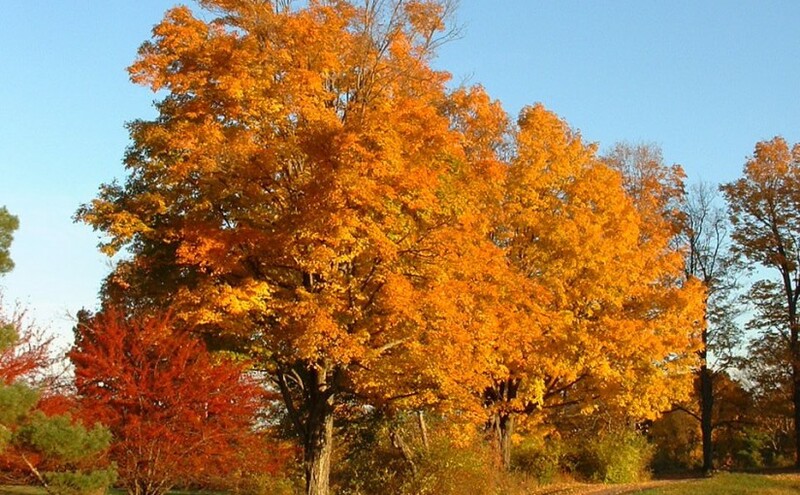 You can take a train at Boston for Kingston–changing at Albany–and at Kingston take a train to Binnewater–I think the best train leaving Boston is at 11 P.M. Of course if you are in or near New York–we are very accessible, being 3 hours by train from there. If you have never taken the [boat] trip on the Hudson River, it is well worth the day given to it–leaving New York at 9–to Kingston–arriving at Binnewater at 4:30. Swamiji is delighted at the thought of seeing you and your sister. Arrived at Kingston at 7:30 P.M.–drove to Ridgely and arrived there at 9:30 P.M. Saw Swamis V. and T. and lived with them. The “Big Cottage,” which stood farther from the Manor than the “Little Cottage”- though in the same direction, was a commodious house with ten bedrooms and a curving driveway of its own. It was to be assigned to Mrs. Bull and Olea and very probably Mrs. Marian Briggs, a close friend of Mrs. Bull’s, with a pair of servants to take care of them. 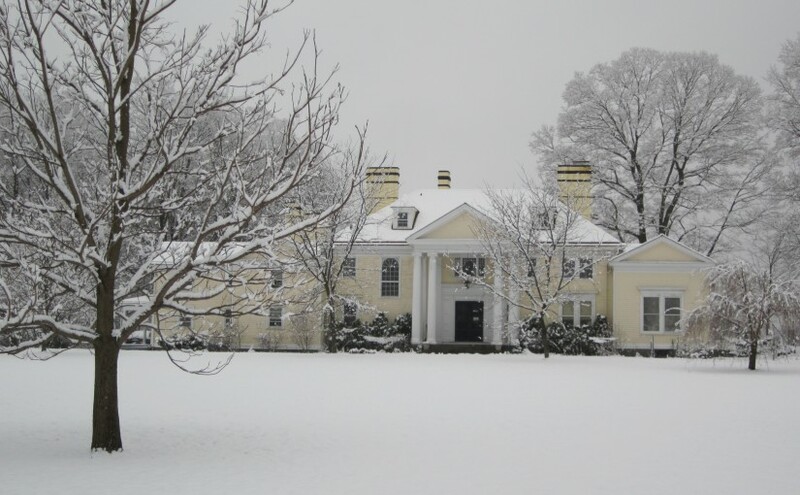 But big as the “Big Cottage” may have been, it was dwarfed–in impressiveness, at least, by the Manor, which encompassed several living rooms, seven second-story bedrooms, and, on its top floor under the roof, quarters for a staff of servants. 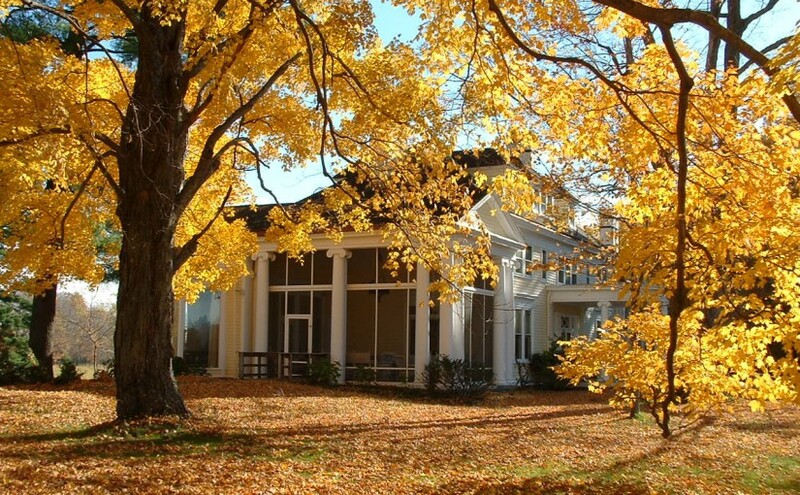 The Manor accommodated the family–Mr. and Mrs. Francis Leggett;Josephine MacLeod; Alberta Sturges, Mrs. Leggett’s twenty-two-year-old daughter by her first marriage; the baby, not-yet-three-year-old France Leggett, and her nurse, Miss Looker–and at one time or another during that summer and autumn various transient house guests, such as Mrs. Coulston, whom we have already met; Sarah Ellen Waldo from Brooklyn, who was invited for a day in early October; Mrs. Florence (Milward) Adams an old friend from Chicago and well-known lecturer on dramatic arts, physical culture, and metaphysics; Miss Florence Guernsey, the daughter of Swamiji’s good friend Dr. Egbert Guernsey of New York; Emma Thursby and her sister Ina; and a Dr. Helmer, a practitioner of osteopathy, which science, then coming into vogue, was Miss MacLeod’s most recent enthusiasm.